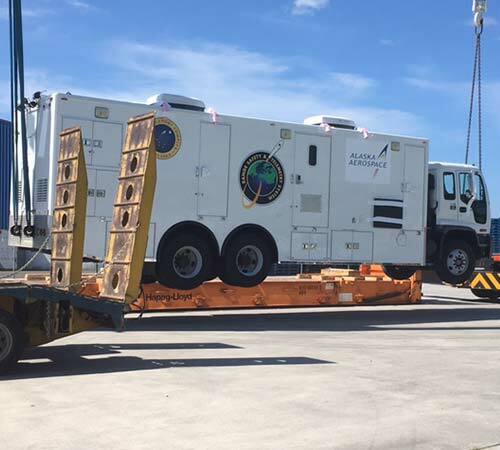 The Alaska Aerospace Corporation supports the launch of rockets and satellites transported to the Pacific Spaceport Complex-Alaska in Kodiak, AK. When the company — familiar with packing and sending their massive launch support equipment by barge within the Northwest U.S. — needed to send equipment overseas, several questions arose. Who would they contact to move their shipment? What documents were needed for customs and what was the process? How would they keep track of this multimillion-dollar system throughout its journey? Already familiar with FedEx as an international shipping leader, Alaska Aerospace engaged FedEx® Space Solutions, the division of FedEx devoted to shipping critical assets for the aerospace industry. FedEx Space Solutions then routed the request to FedEx Trade Networks, the global freight forwarding arm of FedEx, to help navigate the nuances of getting their sensitive range safety and telemetry system (RSTS), a structure larger than an average motorhome, shipped from Kodiak to Mahia, New Zealand safely. They also needed to move four twenty-foot shipping containers of equipment and they needed guidance on customs in New Zealand. "We knew FedEx would have a lot more knowledge than we would. Our core competency is missiles, while theirs is logistics," states Barry King, Director of Range Operations for Alaska Aerospace. At the initial customer meeting, Barry and his team were assigned a single point of contact to help guide them through the move of the RSTS. FedEx Trade Networks determined their needs and specifications, developed the move plan, outlined the best approach and called on their reliable global portfolio of service providers. They also guided them through the customs brokerage process unique to New Zealand. "It took most of the responsibility off our folks," says Barry. Although Barry's team was used to solving difficult problems, they decided this one was better left with FedEx, providing them more time to be productive, and providing an overall lower transit cost than they could achieve on their own. After extensive planning and coordinating, the RSTS left Kodiak by special chartered barge and headed to Seattle, WA, where the system was loaded onto an ocean vessel and departed for the Port of Tauranga, New Zealand. Tracking was made easy with updates from their point of contact at FedEx Trade Networks throughout the journey. Once in New Zealand, the RSTS was offloaded and then inspected, reassembled and driven to its final location in Mahia, New Zealand, arriving to support its mission. Alaska Aerospace plans to call on FedEx Trade Networks for help with moving their oversize, sensitive aerospace products in the future. "Our assigned single point of contact was very energetic and excited about the project, sensitive to our needs and understood our concerns." Let us help get your next mission launched. To learn more about how the FedEx Trade Networks freight forwarding portfolio of services can help boost your business, contact your local account representative or call 1.800.249.2953.